After taking a week off (I actually flew out to New York two weekends ago) and as thus wasn’t able to rework my spreadsheet in time for the predictions of Week 4. But I am back and raring to go with Week 5 predictions. 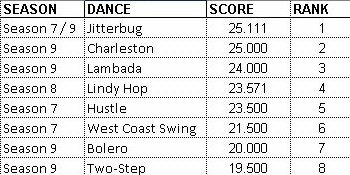 Since we are heading towards what I call the “middle third” of the season the only scores from the previous seasons that I will be focusing on will be those from Weeks 4 thru 7. Because of this breakdown… in the case of Peta she has done a Rumba before but in the first few weeks of Season 13 with Donald. 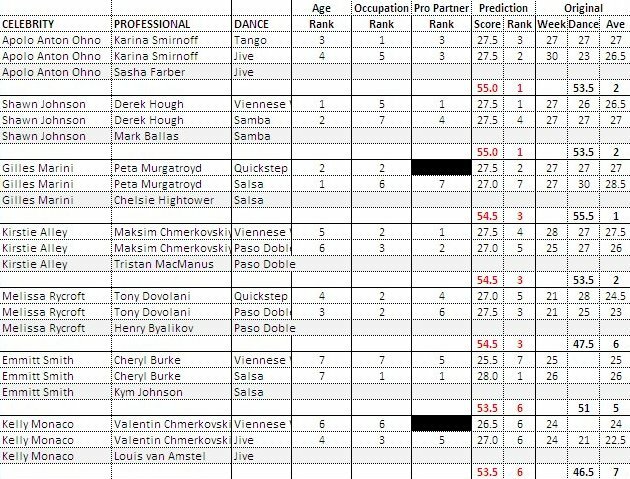 Consequently those celebrities in their 60s have done a Quickstep but again only in the first two weeks of their season… so to stick with some sort of accuracy I chose not to include those scores. However, with those missing scores it seems rather odd for Kirstie to be placed so high (though it could be possible) while Melissa is placed so low… Again as proven in past prediction posts… they tend to be a crap shoot… so take the above with a grain of salt. In the meantime let’s look at how the scores went at the end of the day for Week 3 and (from what is available in Week 4). Ok… just to get this out of the way… predictions are shot for Week 4. Since there are only four dances that have been on the show before (Charleston, Mambo, Jitterbug and Bolero) while the rest have either been a group dance (Rock N Roll, Disco) or were featured in the Results show by other dance groups (Bollywood, Contemporary, Hip Hop, Broadway)… there is no way I can truly predict scores… but I sure as hell will try. 🙂 Who could have predicted what the dance pool was going to include? I thought it would re-introduce dances that just didn’t have some exposure on the show as I posted last week. So how will the scores stack up with the data that I have available? See what I mean by this week’s predictions being a crap shoot? I mean seriously! The only dances that have any scores that I could work off of are highlighted in yellow and are the closest to “traditional” ballroom dances. While the ones in orange are the dances that are absolutely not your traditional ballroom dances. Those that are left have actually been featured on the show in group routines for the season cast. Before I move on… Warning: extra long, YouTube video link heavy post to follow. Also Lori added additional commentary wherever she is able in regards to Week 4’s dances / couples. Also there is a little bit of a conversation going on in the comments in the DWTS Season 15 Stats Class Week 4’s Challenge. Read more..
Those dances highlighted in “yellow” are those that not only have had minimal exposure on the show, but also scored rather low in the grand scheme of things. Those dances that are highlighted in “pink” are those that have had some exposure on the show but still scored low. If anything… if I was helping produce the show I would probably use the above dances (and maybe include other dances that have had minimal exposure on the show like the Charleston, Jitterbug, Lambada, and Hustle) as the pool of dances to be used for the upcoming week. Looking through all the dances that have been featured on the show and have had some exposure I realized some interesting things. There were several dances that were introduced into the show in the midway point of the series and have been staples ever since (Argentine Tango, Viennese Waltz), while there were other dances that were “taking a break” as it were but then have been staples since them (Salsa, Tango, Waltz). The Mambo was only featured for a handful of seasons in the middle of the series: Seasons 3 thru 7. So knowing all this… which dances did I pull the below preferences from? Well the easiest would be the following: Bolero, Lindy Hop, Two-Step and West Coast Swing. These four dances not only got the least amount of exposure on the show but also had average low scores during their short run on the series. The Mambo has been on the show for only five seasons and was scored low frequently so I would toss that dance into the mix. Finally what about the other four? Aka the Charleston, Hustle, Jitterbug, and Lambada? It is hard to say since they ranked high on the scoring table. I tended to shy away from these dances in my quick analysis below, but feel free to include these in your comments if you feel inclined that you’d like to see a particular celebrity dance these dances. 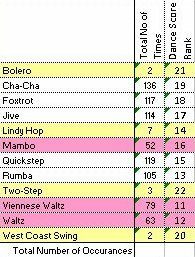 So my final pool would be from Bolero, Lindy Hop, Two-Step, West Coast Swing and Mambo. But before we start figuring out what dances would provide a challenge to each of the dancers… let’s look at who has already attempted any of the above dances? 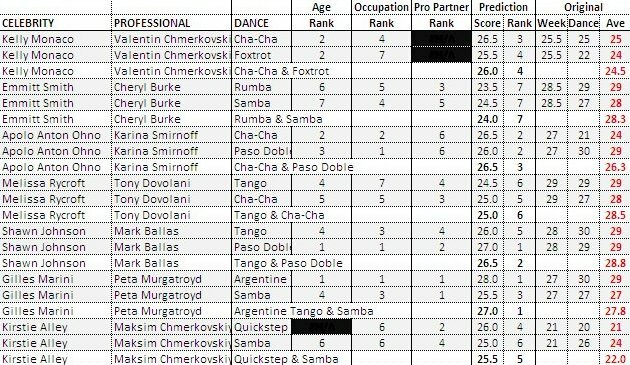 So in regards to dances: Shawn, Melissa and Gilles all have a little bit of an edge by having done the Lindy Hop in their original season, but the Lindy Hop had an average score that is in the higher half. Personally, if I were to choose dances that I would like to see next week they would include the Bolero, West Coast Swing and Lindy Hop. I am actually surprised that Tony Dovolani has not done a Samba this early in the competition. That can’t be right. Well I looked at the past seasons and the earliest that Tony has done a Samba was in Week 5… which for the purposes of the predicted calculations would not be used as Week 5 is considered to be the middle of the seasons and not early. To be honest I am surprised that Drew Lachey is ranked so low while Bristol Palin *shudders* is placed high. I guess we are going to have to see. As you can see the numbers when you compare the predictions to the actual are all over the place. Thus another reason why one cannot use past data for such a subjective sport. However, when one would look at the original scores (when averaged up) what I found to be interesting is that for the most part the rankings of the original scores were similar to the overall rankings of the actual scores. Sure there were a few anomalies here and there (Drew Lachey being the major one), but at least there is some consistency going on. Like I said before, I apologize for the delay in the posts from last week and this week… and I hope to be more up to date after this week… so bare with me in the meantime. If I were going to guess at who would most likely be going home based on what I know thus far… with Helio and Drew having already been at the Bottom Two, and this week being a double elimination… It is hard to say. However considering that both Drew and Helio are predicted to be the in the bottom three lowest scoring couples (with Kirstie) my best bet would be on one of them. Helio is most likely to go due to his predicted early eliminiation. Kirstie and Drew are also possibilities at this point based entirely on predictions, even though I would honestly love to see Bristol go too. So I would bet on Helio going with a toss up between Drew and Kirstie… and Bristol as a wish list elimination.